Now that iPhone 3.0 sdk is public, I think I can ask this question for those of you that have already been playing with the 3.0 sdk. I want to record audio in my application, but I want to use AVAudioRecorder and not the older way of recording like the example SpeakHere shows. There are not any examples of how to best do this in the iPhone Dev Center and only reference to the classes. I am a newbie at iPhone development, so I am looking for a simple sample to get me started. Thanks in advance. Its really helpful. The only problem i had was the size of sound file created after recording. I needed to reduce the file size so i did some changes in settings. File size reduced from 360kb to just 25kb (2 seconds recording). I've been trying to get this code to work for the last 2 hours and though it showed no error on the simulator, there was one on the device. 2.Add below import statement 'AVFoundation/AVFoundation.h'. 5.Define Recorder and Player etc. Here is the complete example code which may help you. In the following link you can find useful info about recording with AVAudioRecording. In this link in the first part "USing Audio" there is an anchor named “Recording with the AVAudioRecorder Class.” that leads you to the example. I used this code and added it to the avTouch example fairly easily. With the above code sample and the sample from the reference library, I was able to get this to work pretty good. As per the above answers, I made some changes and I got the correct output. Here is the source code. Please have a look at once and use it. // CALL YOUR METHOD HERE - as this assumes being called only once from user interacting with permission alert! // this should not happen.. maybe throw an exception. // Initialize degate, metering, etc. Not the answer you're looking for? Browse other questions tagged ios objective-c iphone audio recording or ask your own question. How to record an audio file in .mp3 format? How to record audio through an iPhone app? 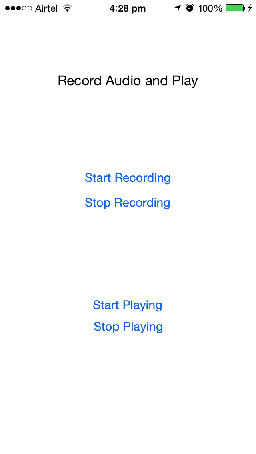 How to record an audio and play the recorded audio in Iphone sdk? How to Convert .caf file to .mp3 file? Recording Audio from Mic in iPhone SDK 4.0? How to generate audio wave form programmatically while recording Voice in iOS?